The news is dismal - falling home prices amid record foreclosures, the credit crisis, inflation-eroding pay, declining dollar value, and layoffs everywhere - a continuing downward spiral, which means that it is time for HR professionals to get busy! They must look at measures that they can bring forward to help ensure the health of the business and its staff. Weathering Storms: Human Resources in Difficult Times is SHRM's compilation of ideas and policies by leading HR professionals addressing the urgent consequences of the economic downturn. The most fundamental question the book answers is "what is the strategic and day-to-day role of HR during economic hard times?" A typical response to hard times is layoffs, but what are the alternatives to layoffs that might achieve similar results? If downsizing occurs, how difficult will it be to rebuild human capital in the future? If layoffs are required, how should they be conducted to minimize causing new problems? 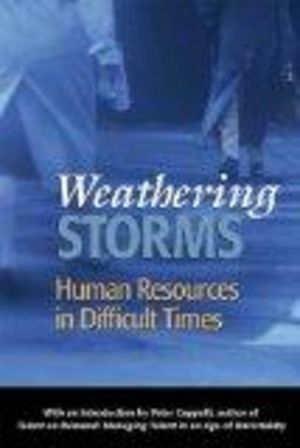 The book's solutions-based, practical approach strongly argues that the HR community has a proactive and persuasive role in making sure their organizations not only weather the problems they are facing today but also help the organization hit the ground running on the other side of the downturn. Conclusion: After the Layoff: How Are You Feeling?